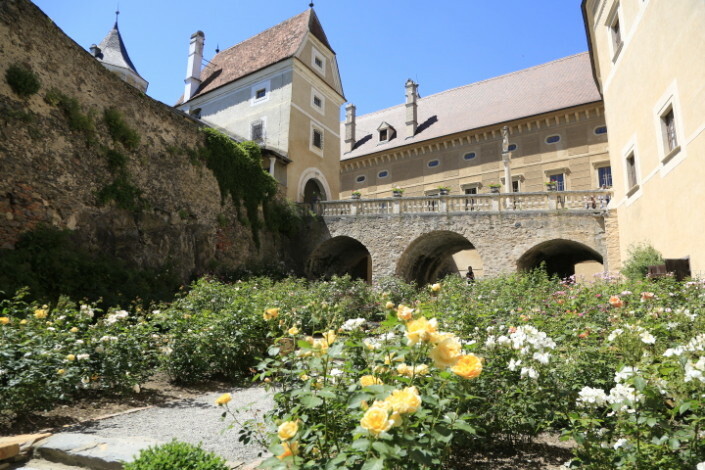 The Rosenburg has expanded its offer with lovingly arranged gardens. Romance and roses are the focal point in this connection. Four self-contained garden sections with four different themes invite visitors to enjoy the surroundings. They entice visitors into a world of tranquillity and contemplation. The ROSE WALL, the ROSE GARDEN and the DAVID AUSTIN Show Rose Garden are certainly impressive. The oldest preserved Tilt Yard is one of the main attractions at Rosenburg. The climbing Rose Wall extends over a total length of 120 metres on the west side. The numerous flowers arouse the impression of an imposing Rose Wall in the blooming period. 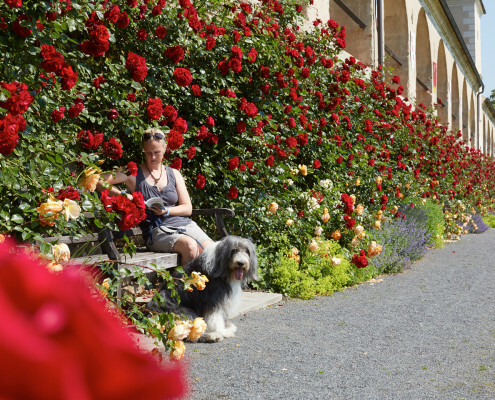 The numerous sitting niches between the seas of red blossoms invite visitors to linger, and the walkway along the Rose Wall guides visitors into the romantic Old Rose Garden. The opposite side of the Tilt Yard is lined with old wild rose bushes which stand out in the autumn due to their fragrance and the large rose hips. 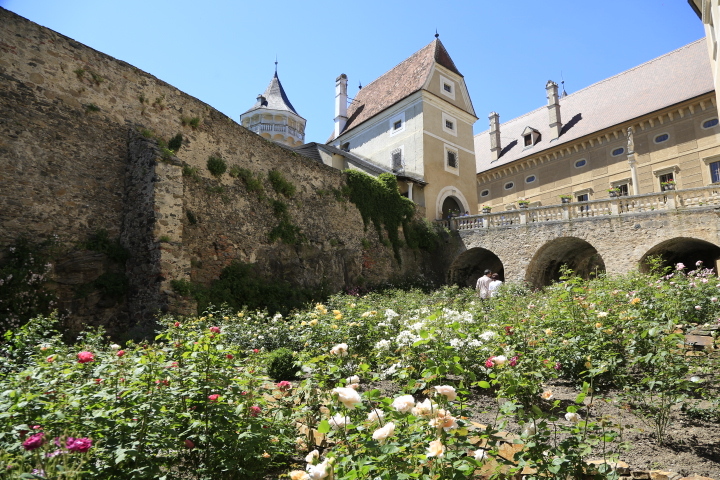 Rosenburg Castle is among the oldest castles in Lower Austria which have laid out their own rose garden. 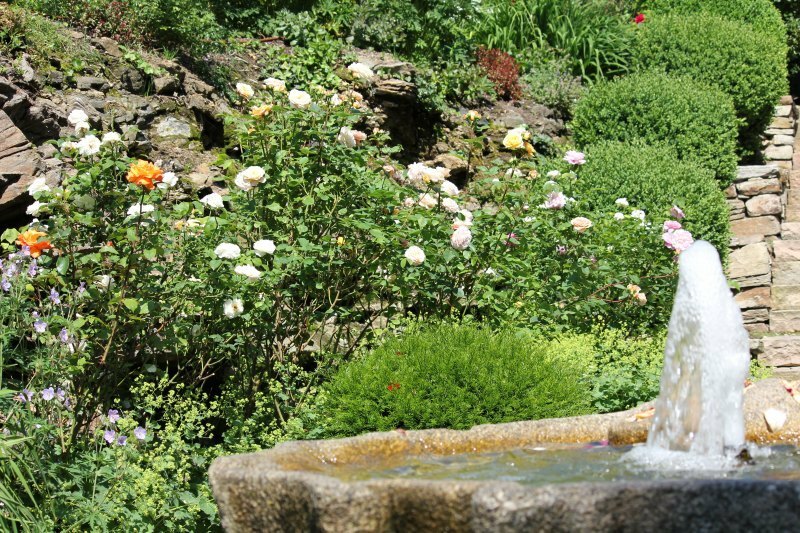 This is located at a historic place that was already used during the Renaissance era as a pleasure & promenade garden. This part of the garden, situated in the former castle moat, impresses through the natural charm of shrub roses and garden roses which are accompanied in a harmonious composition by classic rose companions such as lady’s mantle, geranium and catmint. Flowers, blooming shrubs and small groves complete the arrangement. 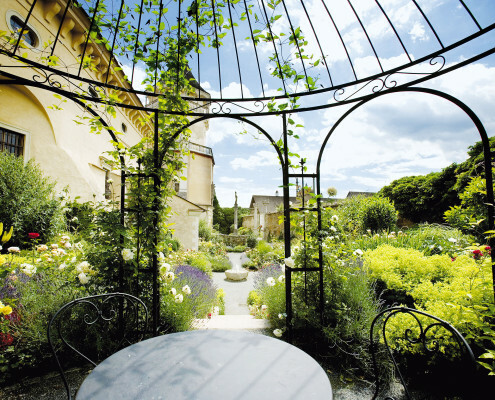 Hidden sitting niches surrounded by fragrant roses invite visitors to relax and dream here. A small fountain in the middle of the visual axis underscores the gentle atmosphere. Soft background music allows visitors to relax and forget everything around them. A wonderful combination of romantic fragrant roses and a balanced undergrowth planting with shrubs and grasses has succeeded in the Old Rose Garden. 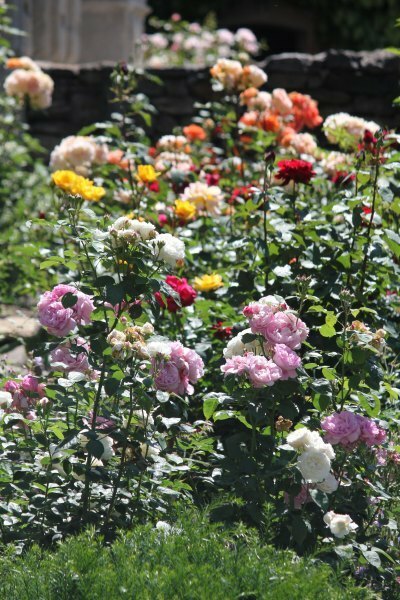 Here rose lovers can get inspirations for the rearrangement or reconfiguration of their own garden. 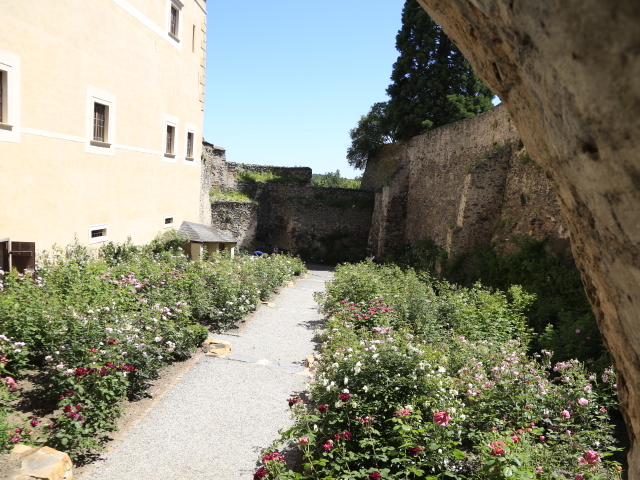 The Herbal Garden, whose herbs are also still used in the Castle Tavern’s kitchen today, is located right in front of the entrance to the old castle kitchen. A water lily pond forms the centre of the Herbal Garden. Four beds are arrayed around the pond with various herbs. In addition to classic kitchen herbs, special fragrant and medicinal herbs can also be found here. The planting is altered every year and attempts to show the broad range of the most varying local herbs. Since March 2012 Rosenburg Castle has a Show Rose Garden that is completely dedicated to the rose breeding efforts of legendary British master breeder David Austin and has been laid out according to his concept. 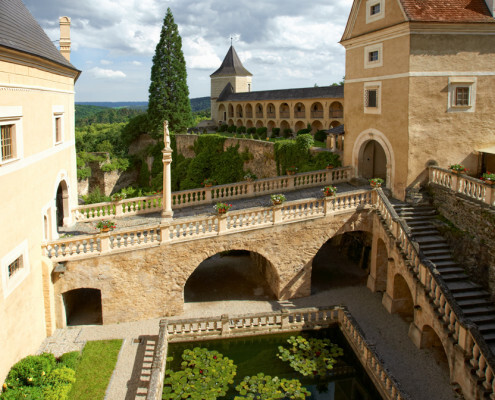 Such a garden is unique in Austria. More than 500 English roses have been arranged here in groups of three to five items of the same variety on the newly installed terraces. Large bushes which fully accentuate the beauty of the unique and completely different rose blossoms emerge from the individual roses. Whether the view is from above over the terraces down below or upward from below – it is always an overwhelming sight. These bushes exhibit their full splendour during the main blooming period in early June. The enchanting fragrance of these wonderful roses unfolds in windless moments. Rose breeding by David Austin Roses Limited has an over 50-year history. 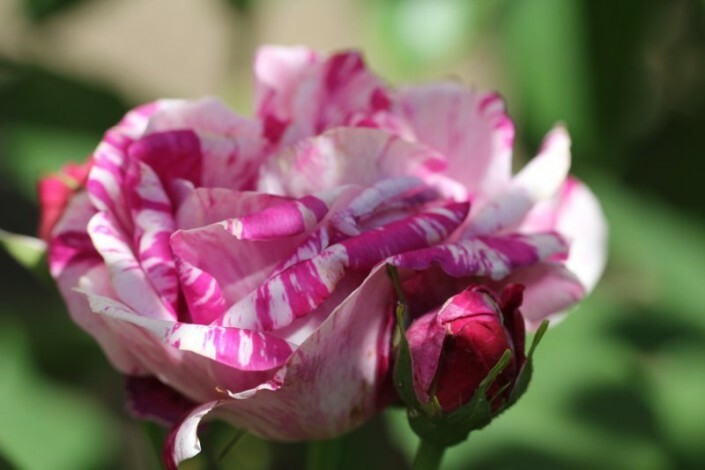 Based on this experience, over the years roses have been created which combine the delicate charm and the growth habit of old roses with the broad colour range of perennially blooming modern roses. Old English fragrant roses – which are also referred to as “romantic roses” – are a speciality of the rose breeding native to England. These beautiful roses are especially treasured due to their wonderfully filled blossom shapes, which range from deep bowl-shaped to perfect rosette shape. Their fragrance spectrum ranges from the aroma of tea rose via musk, myrrh and fruity to the unmistakable fragrance of old roses. 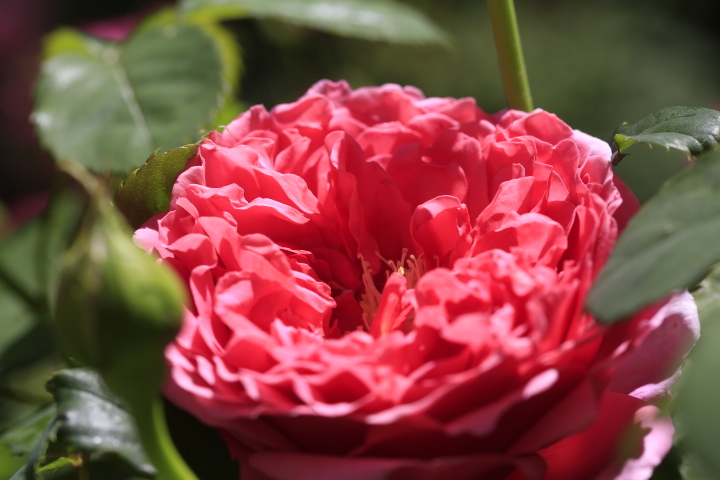 A rich colour range complements the merits of these rose species. The long tradition of breeding by David Austin has brought forth a very great wealth of varieties. These differ in growth, blossom colour, blossom shape and naturally in fragrance. 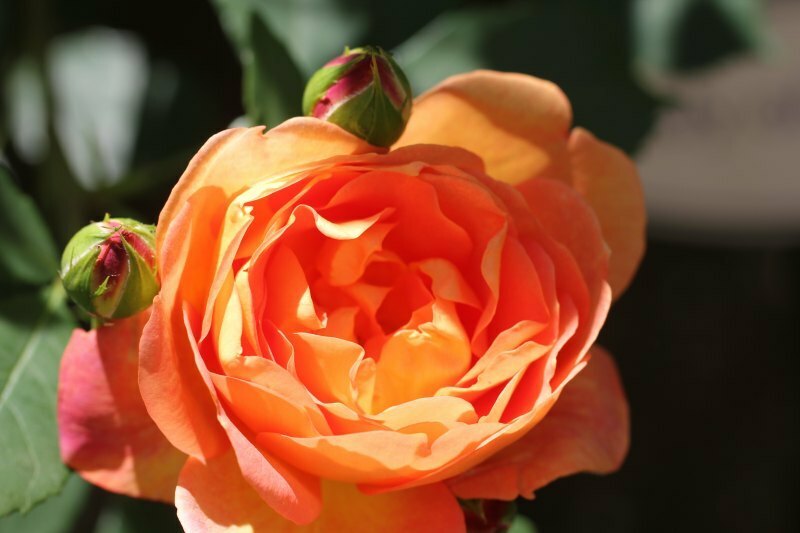 In addition to shrub and climbing roses, the legendary rambler roses are particularly popular and coveted among rose lovers. Ramblers can climb up to 8 metres and are very gladly planted as an optical complement to large trees. The rose climbs into the treetop and forms veritable cascades of blossoms there. 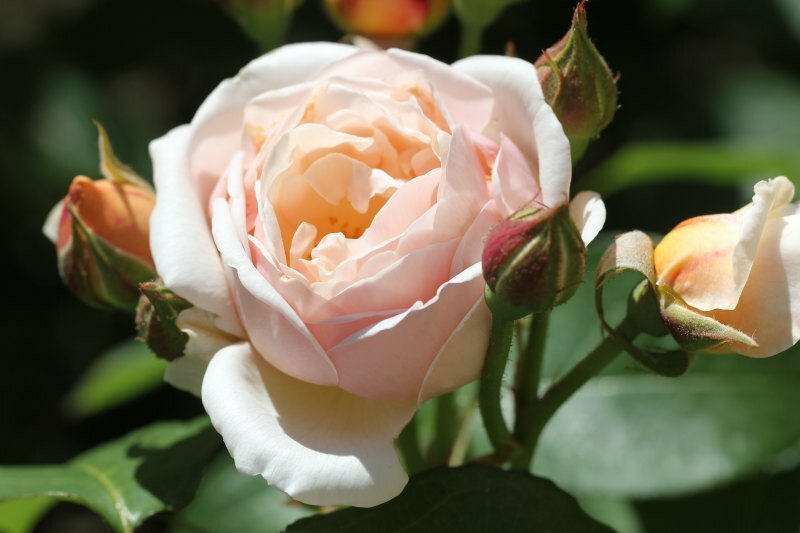 The rose rarities include bred-back roses which come very close to the age-old varieties from the Middle Ages in terms of appearance and fragrance.